I finished binding this and it is on the table. Do you put labels on your finished table runners or toppers? I've put one on this but I haven't sewn it completely down. I'm thinking I might want to use the reverse side sometime so I'm considering removing the label. Scroll down this page to see what the reverse looks like. I've got one set of threads to tie off on this wall hanging and then it is time to find a backing and quilt it. Now I wonder if I want to make another project from this Kim Schaefer's Calendar Quilts. I'm planning on quilting on Bernie rather than the long arm. It shouldn't take all that long once I get started. I will also be using a wider binding as the butterfly at the top will get lost under the hanger I plan to use so a wider binding should help her show. 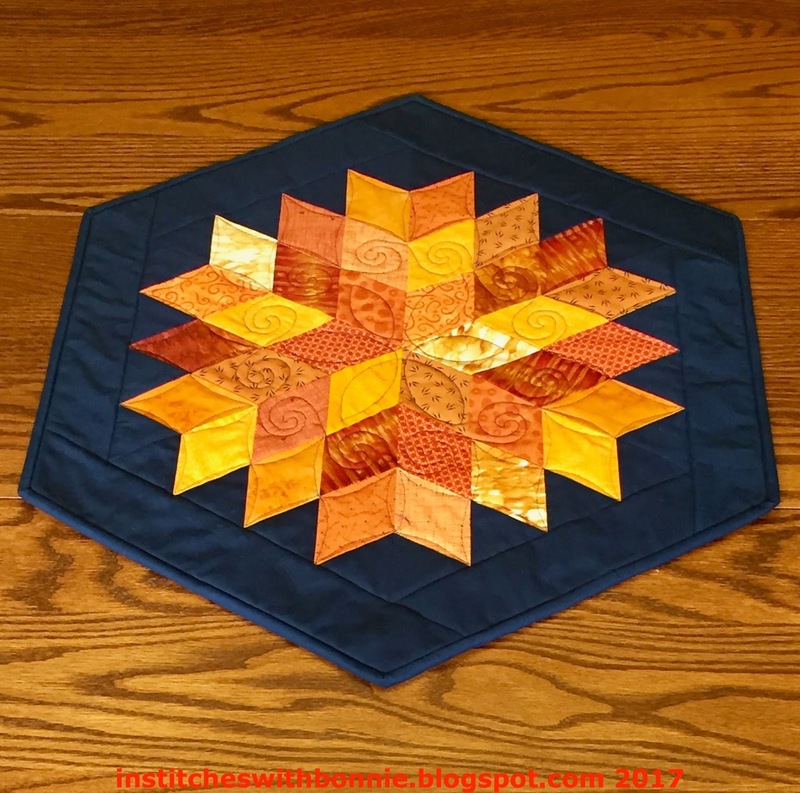 FYI -- both of these quilts were made from my scraps, except the binding on the table topper. I ran out of the navy blue Kona. Once it was replenished I was able to finish this off. The weather at the beach was pretty iffy for most of the days we were there. (Heck, we were only there for 48 hours and we got to the beach both days.) The humidity was relatively low until the day we left. Unfortunately, Natalie was sick when we got there. It turns out that a fever and throwing up are symptoms of strep throat which is what she had. Who knew? Jenny had plenty of ear infections and strep as a child but neither of us remember any nausea. Natalie is well on the road to recovery now. Because I planned my goals for the amount of time I had available I was able to check off every item on the list this week. And now this coming week . . . If I can keep focused this week I should be able to get a little done on each project. I'm linking up with my regular group of linky parties: Monday Making, Moving It Forward and Main Crush Monday. I'll check in Monday morning to add links to the other two blogs. I'm so proud of myself when I can get my blog written Sunday evening. Usually I'm taking pictures on Monday morning and then writing. I just realized that Oh Scrap is up on Sunday so why haven't I been linking to it? A very productive week, and time for fun, too! the flowers are so cheery and look like summer, table mat is stunning speedy recovery I heard of a couple other s with strep now. No, I don't put labels on table runners or mats. I could sign it with a pen somewhere and call it a label, but I haven't. Ooh, I love the flower wall hanging - it looks fabulous. Love your table topper and wall hanging. 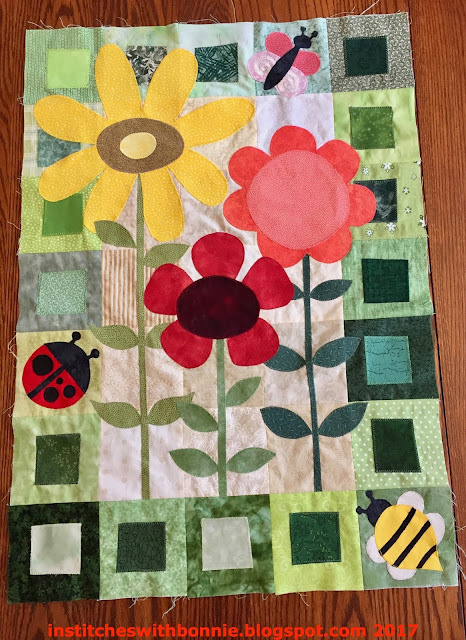 I made the wall hanging for July from Kim Schaefer's Calendar quilts and I made the one with the water melon and ants to use for August on my mom's wall in the nursing home. They are fun to make. You made nice progress on your Kim Schafer wall hanging, are you keeping this one? I like your table runner too, and no I don't label anything basically...I am lazy!! Love the calendar quilt--so fun and happy! Glad to see you are linking up with Oh Scrap! We love to see your projects. Glad Natalie is feeling better. Your projects look great. I can see why you would want to use the reverse of the table topper. Lovely! Love the table topper! Very pretty. The wall hanging is so cute! Good luck on your goals this week.